Editor's Note: This post is part of TriplePundit's ongoing coverage of SXSW Eco 2015. You can read our other coverage here. How do you reuse a dirty, smelly waste material like the sludgy mess from industrial food production to create bioplastic? One team is doing just that. They're taking advantage of food waste sources that likely have not been previously tapped. Imagine the mess that is created by the fermented food waste in your garbage can for a second. Was that long enough to smell it? Who really wants to work with that? 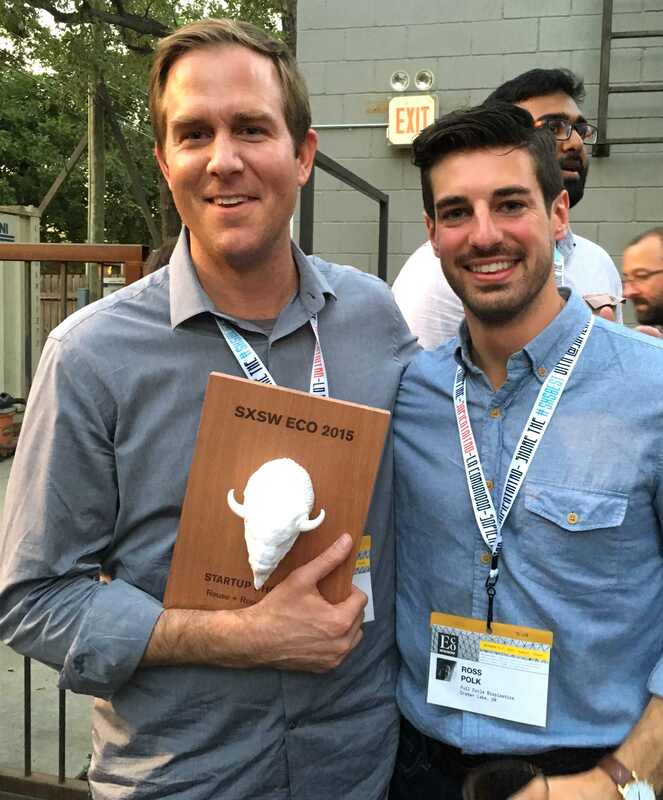 Whether driven by the desire to be gold star eco-citizens or because they hope to succeed where others have failed, Brian and Ian with Full Cycle Bioplastics shared their team's award-winning plan with me and at SXSW Eco this week. Brian recalls the first time he saw the process with founders Jeff and Dane in a lab crammed into their home. He described the experience as a bit surreal; it’s crazy going into someone’s house and seeing all this equipment strewn all over the living and dining rooms. But it must have sold him on the business model. That, or perhaps Jeff and Dane’s expertise in wastewater and environmental engineering showed promise as they successfully experimented with PHA (polyhydroxyalkanoate) producing bacteria. After effectively producing the PHA resin pellets used to create bioplastic, they filled out the team by including another partner, Ian, who during our interview jokingly said, “don’t quote me because I’m not the scientist." He’s the financial brain of the operation. So, PHA as a bioplastic isn't new: Hasn’t someone tried this before? Previous issues included sourcing a high enough quantity of organic material, thus previous attempts in the market have produced low yields. Waste-producing companies that currently pay someone to take this material away may decide that they think they can charge for it once someone can use it. How do you ensure there is a good market for PHA to become profitable? Our current industrial agricultural model makes use of pesticides and herbicides as discussed in Cornell’s Compost Quality Standards and Guidelines. This may be something to consider as this mixture potentially contains PTEs (potentially toxic elements). PTEs are a concern with compost quality, and since this product comes from composting material, it would be ideal to test these products for toxins as they are intended to go back into the environment after use. How is this team doing it differently? Waste: This process is distinctive from previously developed PHA bioplastics because it starts with a zero-cost waste solution rather than by the purchase of and fermentation of expensive and usable crops. They plan to take any food-related waste sludge from: compost, food production and maybe even garbage. Water: Both Brian and Ian described the process of creating PHA as a benefit in water-constrained regions. The production involves fermentation of materials that already contain at least 60 percent water, so no water needs to be added. Later, water is extracted and can be used like gray water, so luckily it can also be returned back to the environment. Compost: PHA composts quickly. It should win best-in-class as a plastic that does not contribute to the Pacific Gyre garbage patch. This type of bioplastic can degrade in soil, water or anaerobically. PHA is also shown to degrade much more quickly than PLA. Closed-loop plan: The team intends to connect all parts of their business. So, in the end, the waste of a processing plant can be used to create something usable and potentially be sold back to the business. It's planning for its treatment structures to exist on-site at many industrial food processors. By collocating a PHA processing setup, which Ian said "looks like a scaled-down water treatment plant," the processing system would be centrally located on-site to collect and transform the waste, thus enabling the quick delivery of the resin to a plastics manufacturer nearby. Begin with low-cost products to grow the business: Products within the agricultural industry may include shipping palettes and landscaping film for crop fields. Resin can also be used to create more readily-compostable utensils and other plastics not requiring a high purity at this time. By keeping costs low, the company is more likely to get broader product reach and acceptance. Helps achieve zero-waste goals: As we move toward achieving zero-waste goals in many cities, these initiatives create a strong incentive for cities to partner with groups that are using waste that would typically end up in the landfill. Scaling up slowly: This group is beginning their pilot in 2016 with the San Francisco Bay Area and is planning to start small with the production of 15 pounds of plastic resin per day. After confirming the success of this process, they see the potential to scale up quickly into several tons per day. As humans, we create a pretty limitless supply of agricultural waste. Full Cycle Bioplastics has the right idea by upcycling this waste into a usable material. The best part is that this plastic’s end of life includes the potential to recycle it into right back into the same products or you can toss it directly into your compost bin. Congratulations to this team for innovating with PHA and winning a startup showcase award at SWSW Eco 2015! Heidi Travis is a full-time planner, designer, and lover of being active in the beautiful outdoors. Heidi recently made a move to discover everything Austin has to offer after growing up in Atlanta, enjoying life in the mountains of Asheville, and appreciating the convenience of living in a city like Philadelphia. While in Philadelphia, she earned her Masters in Environmental Studies at Penn and enjoyed biking to work, as well as being involved in many campus sustainability projects.